Location: 118 East South St., Raleigh, N.C. Founded in 1865, Shaw University is one of the oldest HBCUs. Nearly a century after its establishment, it played a significant role in the Civil Rights Movement. In 1960, under the helping hand of Ella Baker, Student Nonviolent Coordinating Committee (SNCC) was born on Shaw's campus. After working with both the NAACP and SCLC, and feeling motivated by the Greensboro sit-ins, Baker convinced the latter to invite students to the Southwide Youth Leadership Conference on Easter weekend. The conference was a success, producing SNCC. The organization would go on to be instrumental in the Freedom Rides of 1961, the March on Washington, Freedom Summer, and a fierce voting rights campaign that spanned the early-to-mid '60s. 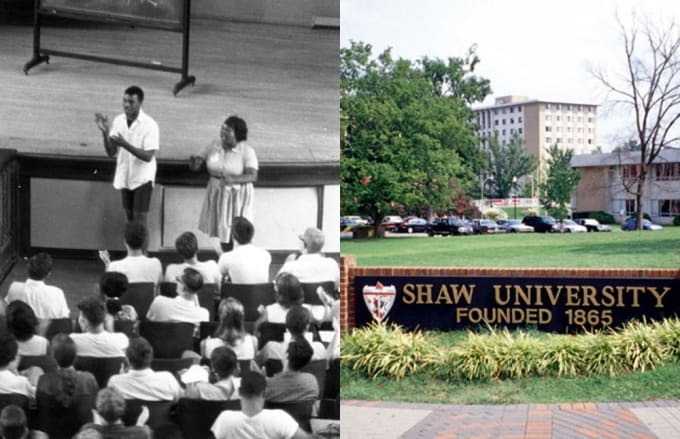 With a student body of 2,800, Shaw University is still going strong, and in April of 2010, the school hosted a conference to honor the 50th anniversary of the organization's foundation.